Emmanuel d’Angelo is a passionate Image Processing and Computer Vision engineer. His research interests include 2D and 3D data processing, non-locality, photogrammetry and georeferenced information analysis. He’s now a technical manager at Pix4D learning the techniques of Product Management. We present a method to extract per-point semantic class labels from aerial photogrammetry data. Unlike previous point cloud classification methods that rely exclusively on geometric features, we incorporate color information yielding a significant increase in accuracy. We test our classification method on three real-world photogrammetry datasets generated with Pix4Dmapper Pro, achieving good accuracy and generalization. Local Binary Descriptors (LBDs) have become very popular for image matching tasks, especially when going mobile. However, their ability to carry enough information to infer the original image is seldom addressed. We leverage an inverse problem approach to directly reconstruct the image content from LBDs and without requiring either a prior learning database or non-binarized features. Interestingly, our reconstruction scheme reveals differences in the way different LBDs capture and encode image information. Local Binary Descriptors (LBDs) are good at matching image parts, but how much information is actually carried? Surprisingly, this question is usually ignored and replaced by a comparison of matching performances. Here, we directly address it by trying to reconstruct plausible images from different LBDs such as BRIEF and FREAK and show that this task is achievable using only the information in the descriptors. Vision is a natural tool for human-computer interaction, since it provides visual feedback to the user. It requires however the fast and robust computation of motion primitives. We apply here some recent mathematical results about convex optimization to the TV-L1 optical flow problem. At the cost of a small smoothing of the Total Variation (TV), the convergence speed of the numerical scheme is improved, and realtime performance is achieved using the OpenCL framework. C. Becker, N. Häni, E. d’Angelo, C. Strecha. Classification of Aerial Photogrammetric 3D Point Clouds. In ISPRS, 2017. E. d’Angelo, L. Jacques, A. Alahi, P. Vandergheynst. From bits to images: Inversion of local binary descriptors. In TPAMI, 2013. E. d’Angelo, A. Alahi, P. Vandergheynst. 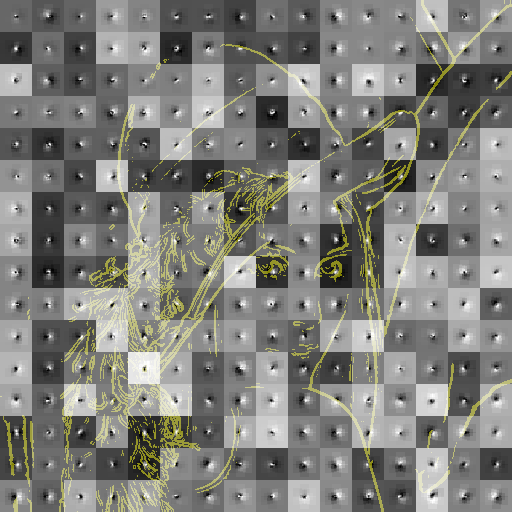 Beyond Bits: Reconstructing Images from Local Binary Descriptors. In ICPR, 2012. E. d’Angelo, J. Paratte, P. Vandergheynst. Fast TV-L 1 optical flow for interactivity. In ICIP, 2009. I was in Paris last week in order to give some lectures for a continuous training curriculum where I teach mostly 3D reconstruction and optical flow computation. Preparing these lessons has kept me busy a few nights, but we had again this year some very positive feedback about our way of teaching those sometimes complex matters. A huge part of our students satisfaction comes from the many demos that we’re using to illustrate the various formula that pop up during the lessons. When starting with Deep Learning on your own (without any legacy code or compatibility constraint), it may be daunting to choose one among the many frameworks available. U-Net was proposed in 2015 for medical image segmentation. You can find the original paper, along with some video introduction on the project homepage. Its structure is relatively simple and shallow, so it seems to be well fitted for a learning work. I’m restarting this blog after keeping it quiet for a few years. What changes to expect? Well, quite a bit: I’m back to Computer Vision, playing with photogrammetry pipelines, meshes, classifiers… I’m moving into product management this blog is now published thanks to hugo with the Academic theme the comments are disabled, but you can interact through the contact address or directly via social networks. I’ve been lucky (and grateful) to attend new events and meet new communities last year, primarily at ISPRS (Hannover) and the Product Management Festival in Zürich. Inferring image content from local descriptors. EUROSAE: MTS-014 Introduction to image manipulation. I am teaching 3 days (out of the 6) of this course directed by Bertrand Collin. While in France, I’ve also given C/C++ programming labs for ENSTA-ParisTech new students.